Can’t leave your fingers alone? This article is for you if you scrape the sides of your thumbs, rip off your cuticles or otherwise mangle your hands. These behaviors, like nail biting, are so common that I notice them all the time. In fact, a few months ago when I was on my way to the Heart and Soul Academy Retreat for Body-Focused Repetitive Behaviors, I sat next to a guy who was picking at his fingers and arms the whole plane ride from LA to Denver, but he wasn’t going to the retreat. There is plenty you can do to reduce these behaviors. Like all varieties of skin picking, there are factors that tend to increase the behaviors as well as methods that work to reduce them. You just need to a) identify and avoid (when possible) the things that make your behavior worse and b) discover and make habits of the things that reduce your behavior. Here we’ll break down both and give you specific strategies for finger picking. A lot of finger picking is simply being physically restless, or fidgety. Picking at your fingers can be a manifestation of nervous energy or just something to do with your hands to keep your brain focused while you aren’t doing anything else with your body, i.e. when reading, watching television or doing sedentary work. Overall strategies for reducing finger picking include both reducing the fidgetiness and also giving your hands something else to do. First of all, what can you do in general to reduce your fidgetiness? Sometimes it’s what you are eating or drinking that causes increased fidgeting and nervousness that manifests in your picking your fingers. The biggest culprits are caffeine and processed sugar, so cutting down on the coffee and sweet treats can have a huge positive effect. Some stimulant drugs can also increase picking, including the ADHD medications Vyvanse and Adderall, in which case you may want to talk to your doctor about trying different ones, or to research treating ADD naturally. There are natural quick ways to get in a calm focused state very quickly, including the technique I teach in a video included in the free Freedom Kit. 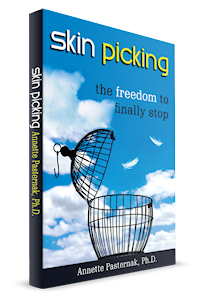 Make sure you sign up for the Freedom Kit and watch the video that’s included, “How to Stop Skin Picking Urges in 2 Minutes Flat.” And then use that technique frequently. You may need to do it at least a few times a day, especially at first. You may also need to take more breaks at work. Try to make sure you don’t sit for even an hour at a time without some sort of movement break, even if it’s just to get out of your chair and go for a glass of water or use the toilet. A quick breathing or mindfulness exercise will help too. Make a new habit of keeping your hands occupied with other activities. There are so many options here. Let’s start with ideas for when you are home. You can knit or crochet or embroider or sew. You can doodle or draw or color in coloring books or coloring apps. Or play with putty or Play Dough. Watch this inspiring video of artist Liz Atkin, who does one-minute charcoal drawings on the London underground instead of picking her fingers. Some activities are appropriate for work or school and are not too distracting. You can often doodle in a meeting, or play with a kneaded eraser or a small amount of putty. The fidget cube is small and not loud, depending how you use it. I like this fuzzy tangle for work or home. Alternatively, you can make it a rule for yourself at meetings that you have one hand holding a pad of paper and the other holding a pen at all times. You can break yourself of the habit and protect your skin by wearing gloves or finger cots or gorilla tips, or by taping or bandaging over the fingertips. Or you can put bandages on the parts of your fingers that you pick at. You’ll have to experiment here. Some people find it helps most to cut their nails as short as possible every couple of days, while other people find having long thick acrylic or other fake nails is very helpful. Moisturizing your hands and fingers can prevent some of the skin issues that are tempting to pick at. Moisturizing frequently can also change the texture, giving a slipperiness that might deter you from picking. More positive care might include polishing your fingernails, which gives the bonus of keeping your hands busy as you are giving yourself a manicure. Looking at a pretty color might motivate you to keep your hands looking nice too, since they are attracting attention. Here’s a video where Jackie, a woman who picks at her fingers, gives some tips and we discuss. We were at the Heart and Soul Academy Retreat live on Periscope so, as it’s not the best quality video, I’m also including a partial transcript below of the more useful parts of the video in case you prefer to read. Please share in a comment below if you have any other things that work for you. Jackie: It’s basically boredom, so if I’m sitting in a lecture, or a meeting, or church, I hate to say that, but just somewhere where I don’t have anything to do with my hands. Like, I’m not writing notes. So, I came up with playing with Play-Dough. Now, you have to be careful where you do this. I’ve told meeting organizers or the professor, “please don’t think I’m rude,” but I need to because I find a lot of us have the same problem. So I will just take a little thing of Play-Dough, roll it around in my hands, feel it. I like to smell it, too, because it reminds me of being a kid. Jackie: And that has really … That’s really helped because it then … It actually helps me concentrate and now I know why. 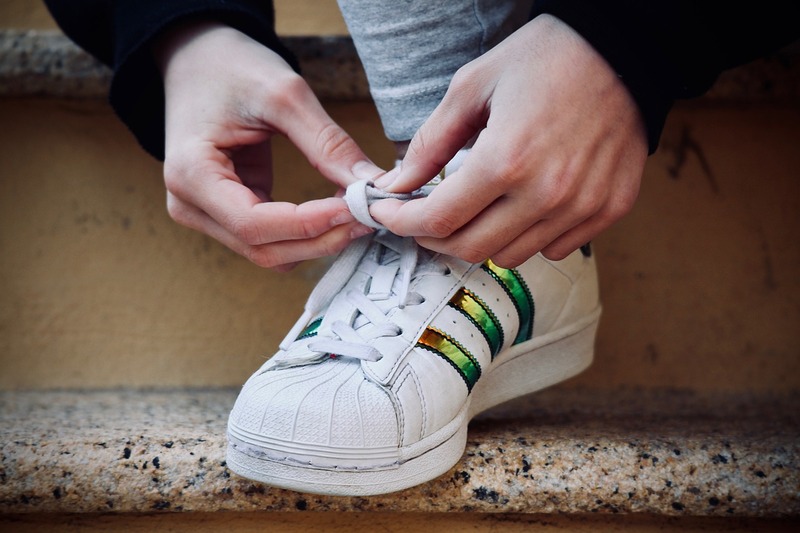 Annette: Yeah, some brain science shows that in order to think better, you need to do repetitive movements, so if you’re studying, it’s great to do these walking treadmills or just get your fingers going with something, and that’s probably part of why we tend to do behaviors like this. Annette: Were doing something sedentary, but using our head. Jackie: We’re using our head. And so that’s my active thing that really worked for me. Somethings that you can do for everyday are you could get your nails done, you can have nail polish on. Nothing super fancy, but just because I like the way it looks, and then if I’m picking my cuticles it will affect it. Something really nurturing and loving you can do is to get a really nice cuticle cream or … I have friends who are really into the essential oils and natural products, and so you get the nice sensation of rubbing your cuticles. You get soft cuticles that, for me, are less tempting to pick, and you get some aromatherapy along with it. Jackie: So these are really simple, simple things that I find. Annette: Yeah, I like the idea of putting positive attention into a place that usually you’re damaging, right, with your attention. Annette: And I loved, in the retreat we’re at, I loved when Dr. Mansueto was talking about facialists or estheticians, right? 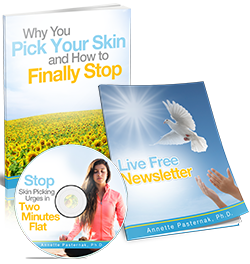 Annette: To help people that have these body-focused repetitive behaviors … For example, skin picking, saying “Get them the treatment. The most involved, most complicated treatment that uses a lot of time, too!” Because the more time you spend doing with the creams and the polishing your nails and all that, it’s the attention that you’re spending and it’s the time you’re taking out, that you’re not doing the negative behavior. Annette: That’s really cool. Do you guys like that tip? Annette: Send some hearts if you do! Annette: So yeah! Did you have any more or is that …? Annette: Look at the hearts! Jackie: Oh, thank you! Thank you so much. When I’m in the car, something I do sometimes, too, is I’ll put gloves on. Whether it’s the summer or the winter, just to kind of be like, you know what? I’m supposed to be driving and not going at my cuticles or anywhere else with my fingers. So, that’s kind of a comfortable thing, too. Annette: Mm-hmm (affirmative). I found that you feel very secure when you’re blocking yourself from doing the behavior. Annette: -They put you at ease somehow. Jackie: Yes, and I bought some nice ones. Annette: Mm-hmm (affirmative). That’s wonderful. Awesome! Well, thank you so much, Jackie! Do you have any extra tips to share? Anything we didn’t mention here? Please add a comment.